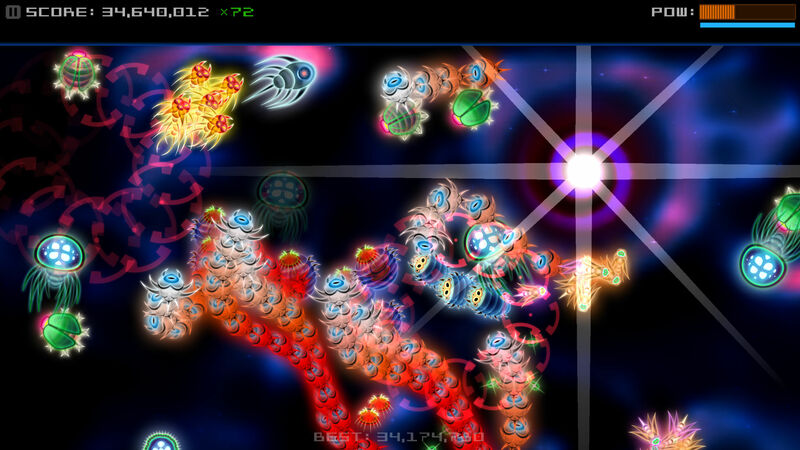 Chaotic Box’s Silverfish DX ($3.99), a revival of the 2010 high score chaser, is kind of like the marriage of Pac-Man with Pacifism mode from Geometry Wars – coincidentally, did you notice Geometry Wars 3 isn’t on the App Store any more? That’s some garbage. You are pursued by enemies, and there are two ways to clear them out: one is by collecting bombs (called energy pods in Trainer mode, the game’s tutorial) that blow up nearby enemies and leave behind multiplier protons which you can pick up. The other element is that the bombs increase your POW meter, and once that fills up, you go into MAX mode, where you turn the tables on enemies and start to eat them for their delicious sustenance, and points. 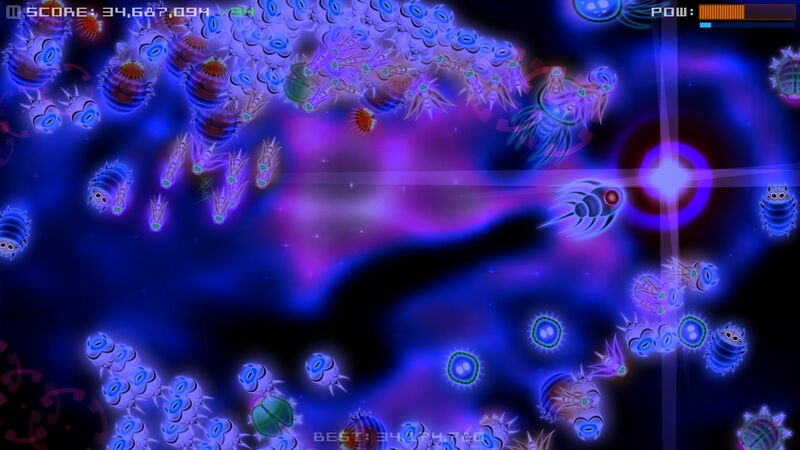 You get more points based on your base multiplier, but each enemy you eat in MAX mode increases your temporary multiplier, so you can get x40 multiplier on top of a permanent x120 multiplier. But if you take damage, then your POW meter drops to one bar and if you don’t get a bomb within 5 seconds, you die. Also, if you take a hit while at one bar, you die instantly. Your POW meter also steadily decreases, so if you take long routes to the bombs, you might find it takes an extra bomb pickup to activate MAX mode. The one ability you have beyond this is Time Shock. Tap the screen, and time slows down and enemies will run away from you, allowing you safe passage to where you need to go. The game is brilliantly tense as you play, because you always have these systems on your mind while you’re trying to just survive. Things just keep ramping up without you realizing it, and you’re making strategic decisions with each bomb. Do you go for the existing hordes, knowing that they’ll run, or for the new ones popping up that you can get to before they scatter? Do you use your Time Shock now to get to a bomb and trigger MAX mode, at the risk of not having it if you need it right after you get out of MAX? Or do you wait, and possibly wind up needing it anyway? So many decisions and tradeoffs have to be made while you play, and the game is fantastic at combining raw thrills with strategic intent. 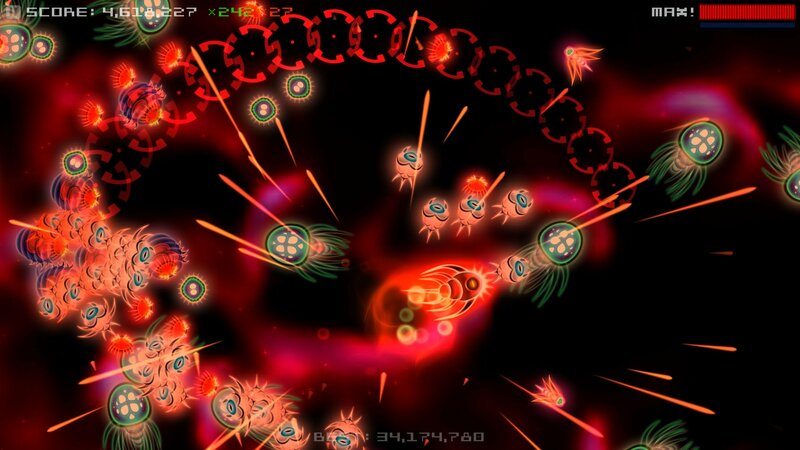 It’s the same way that it feels like Pac-Man, and it feels like Geometry Wars Pacifism, but yet…not. Of course, you’re probably well aware of all this if you’ve played the now-defunct Silverfish releases on iPhone and iPad. What’s the difference between Silverfish DX and the old Silverfish games? First off, instead of being tied to the cardinal directions, you now have 360 degrees of movement. This makes it a bit easier to navigate through tight spots of enemies, as you now can go at an angle, and not just in a straight line! I always found being stuck in the cardinal directions to feel a bit weird when enemies could run everywhere, and this alone makes this the definitive version of the game. If you miss moving in cardinal directions, use the d-pad on your MFi controller. The game supports MFi controls, and they work well, though there is some latency inherent to the MFi controller standard, so you might find it easier to play with the touchscreen. Honestly, I just find them different, like the turning angle is a bit different on each one, and I’ve broken high scores set with each control method while I played, but I got 10 million with touch controls. There is a bug right now with MFi controls where you can’t activate the time burst by hitting the trigger (I also wish this power was on a face button, and not just RT) after the first play session. So, you’ll need to tap the screen to activate that power. The game also has Apple TV support! I feel like my one complaint with Silverfish DX is that it’s kind of shallow because it is just that one game mode. It’s a good game mode, and it’s well-made. But, it’s still just an arcade high score chaser, and while surprises come in the form of enemies that you discover for the first time, you’ll get the gist of the experience rather quickly. It becomes about iteration and improvement on high scores. Perhaps you’ll love that, but just be aware of it when you’re coming in. But, I had a lot of fun with Silverfish DX, and hopefully this version lasts forever, so we don’t have to wait until 2026 for Silverfish DX’ Turbo: Championship Edition Plus.